I worked with HGTV HOME by Sherwin-Williams for this post to bring you my story on how I found the perfect paint color for my design style. Paint was supplied by Sherwin-Williams, but all opinions and experiences are my own. Choosing a paint color can be a very stressful thing. You want it to look perfect and match what you have dreamed up in your mind – but there is that nagging thought of what if it doesn’t look like I want it too? I know these questions all too well. We moved into our home 18 months ago, we all loved it because of the size and it gave everyone their own space. The owners before had painted everything a creamy white, and I mean everything. Walls, trim, ceiling, doors, the same creamy white. 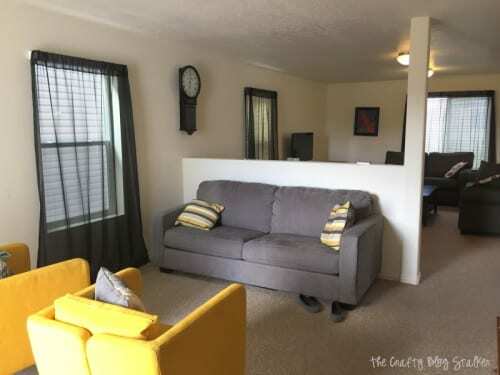 When we first moved in I thought this would be easy to decorate with, and tried to add splashes of color, but I always had plans for what I would do someday when we painted. Days turned into weeks, then months, and now we’ve been here for over a year and a half. I have hung a few things but really not many, because I knew it wouldn’t look the way that I had envisioned. I was finding it very difficult to find my style in a sea of cream. So I just kept dreaming of someday. Recently, my husband and I had this conversation for about the 20th time when we agreed that someday was now, and we needed to stop living in someone else’s house and work on creating our own home. 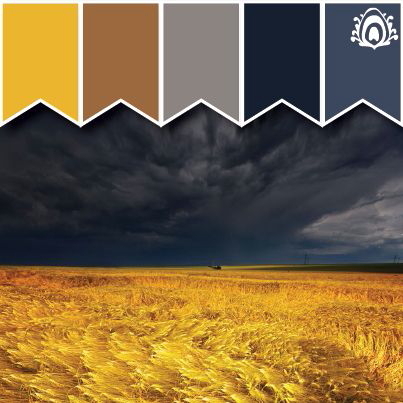 Over the past 18 months, I had saved many different color pallets to Pinterest but they always had the same color scheme of gray, blue and yellow, and whenever I pictured what I would do in my home these colors would always pop up. This is one of my favorites. Now that it was actually time to paint it was time to really decide, and I was a little surprised at how much that scared me and how unsure I was of the colors I had been dreaming of for 18 months. I headed to www.painton.com to finalize and bring to life what I saw in my mind. It is a great website sponsored by Sherwin Williams that shares Collor Collections, Inspiration, Product information, and my favorite the Color Visualizer where you can change the paint color on walls of different rooms to see if it matches your style. 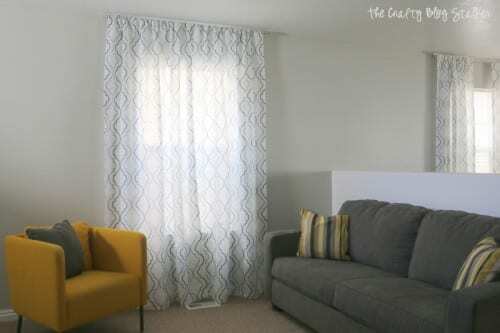 You can even upload your own photo to see the colors on your own walls! What Gray is the Right Gray? I decided to go with my original thoughts and go Gray on the walls with white on the ceiling, trim, and doors. I headed to Lowes to get some samples of the grays to do some test strips on my walls. I painted the strips on a couple different walls so I could see how the different colors looked in different areas of the room. I even had a vote on Instagram asking for votes on the perfect shade. After all of that, I decided that all of the shades were a touch dark. I went back to www.painton.com and played with the lighter shades of the colors I had originally chosen. That is when I decided on Repose Gray. In my eyes, it really is the perfect shade, it’s not blue, not a greige (beige/gray) but a true gray. I had my paint color! 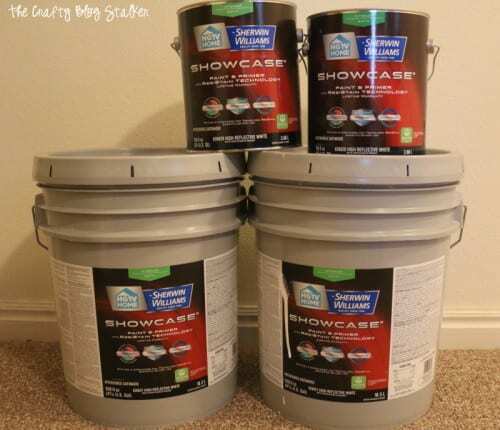 We ordered 5 Gallons of Repose Gray and 7 Gallons of Oxford White in Sherwin Williams Showcase Satin Finish. Now, all that’s left is to paint! 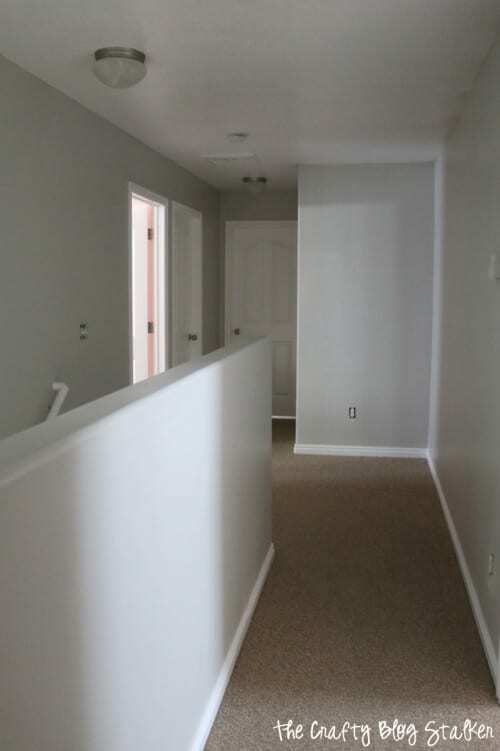 We were painting a pretty big area, our main level that consists of a sitting room, living room, kitchen and dining area, then up the stairs and the upstairs hallway. 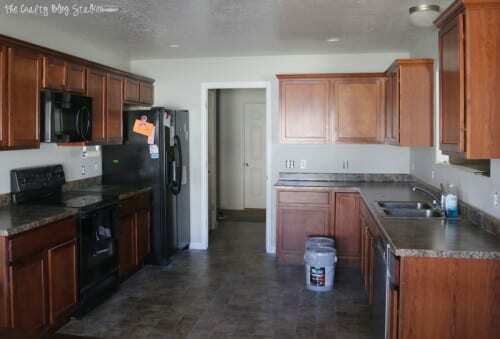 I’m not going to lie, we actually hired a painter because it was such a big a project. We are so glad we did because he got everything done in two days! 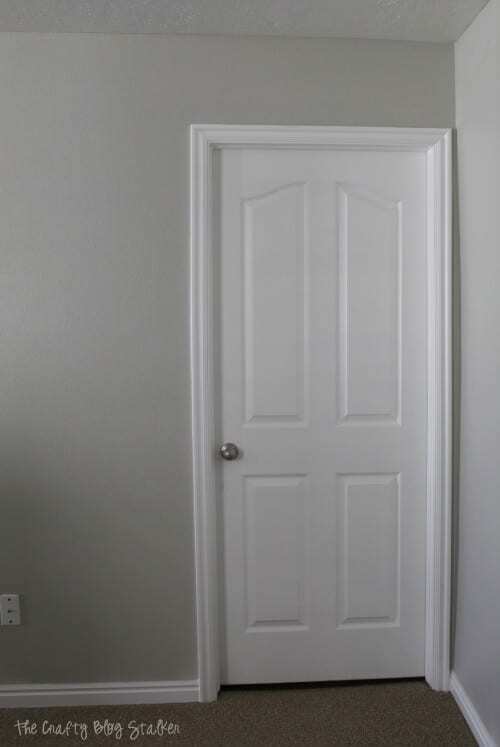 I’m starting with this lovely picture of a door. Isn’t it pretty? I’m really starting here because this is the best picture to show you the contrast between the repose Gray and the Oxford white. In some of the pictures the two colors look very similar, but here you can see there definitely is a difference. Kitchen view from the Dining Room. I have to say I am so pleased and super excited about my home. The colors came out EXACTLY how I had dreamed and imagined them to be. Now I can finally start decorating and hanging my some of my favorite things on the wall! 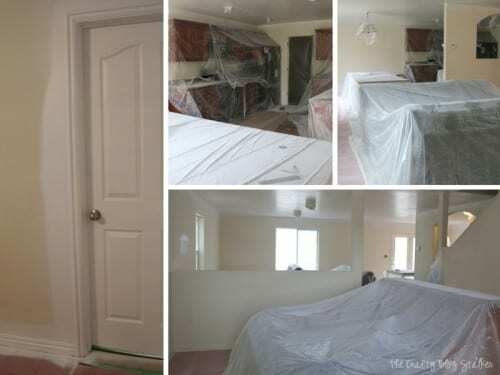 Are you dreaming of taking on a big painting project? Share and leave a comment below! 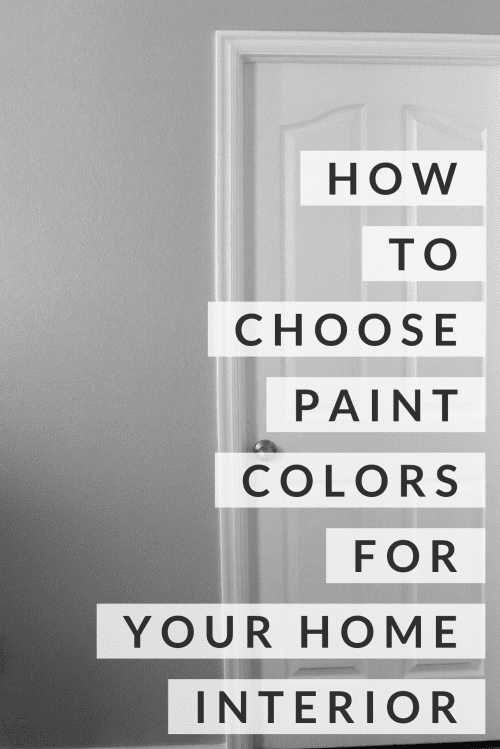 SAVE HOW TO CHOOSE PAINT COLORS FOR YOUR HOME INTERIOR TO YOUR FAVORITE PINTEREST BOARD! What Can You Make With an Embroidery Hoop? Loved your post. 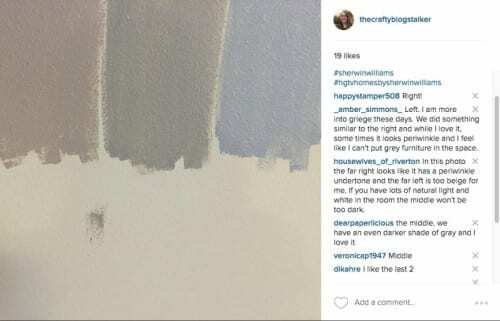 My daughter repainted her whole house last year with Sherwin Williams Repose Gray. My brother is a painter in Ky and that is the one he always uses. I remodeled my office a few months ago and that is the one I did!! 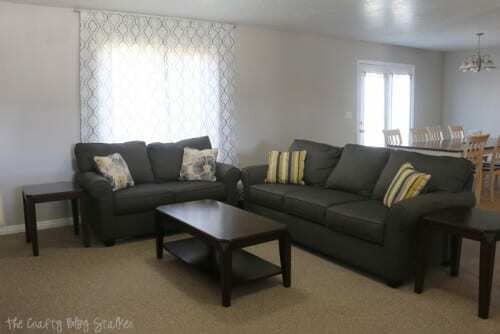 I did a blog post on it on my grandparent blog…http://grandmahoneyshouse.com/2016/03/office-remodel-for-a-spring-project/ I would say that you made a great choice and your house looks beautiful. Thank you! Your office looks fantastic too. Katie it is a very beautiful color. I wonder how you could have lived in someone else’s home for so long! lol. I live in mine that I picked the color for and now I can’t wait to get rid of it. Your home looks lovely and I’m looking forward to seeing how you decorate the walls. I am hosting a new link party over at Sweet Inspiration. I hope you can join us. Thank you Mary, It’s crazy what a coat of paint can do. 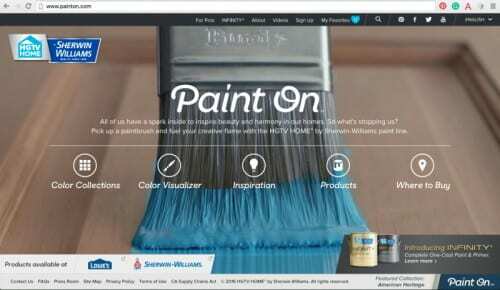 Who doesn’t need some help choosing paint colors, whether you ask family and friends or use a site like this one. You are my choice for featured blog post for this week’s Over the Moon Link Party. Come back after Sunday evening and grab your badge. Thanks for visiting! Thank you so much Sandy! I am so excited! Choosing colors is a real challenge! Glad you found what you like. I’m glad you got there. Creamy white is lovely for creating space, but like you say, it’s not your space if you don’t personalise it. We’re moving house soon and I’m really looking forward to putting my touch on the whole house. At the moment, it’s very much a family home and I want something a bit more modern and edgy. I love the color you chose! Actually the whole color palette you have in mind is beautiful. 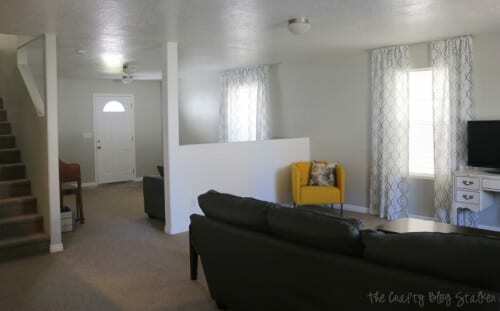 It’s amazing how much paint can transform a space! Thank you, Meg, The project has really been a lot of fun.